This is not a blog, but rather a website for anyone who wants to know more about my research and publications. I’m a sociologist, and I’ve worked at USC for over 25 years. My research strives to lift up the voices and contributions of disenfranchised and often under-appreciated Latina/o immigrants, and to understand the social processes they navigate in their workplaces, neighborhoods, homes, and families. I’m interested in the texture of daily life, especially how people’s lives can be told through interviews and ethnography, and understood in historical and macro-structural contexts. Recently, I’ve gotten more interested in understanding of how place situates the way we live. Doing this kind of work comes from my own life experiences. My immigrant parents left rural backgrounds in different countries (mother from Chile, father from France), and they made their way to the San Francisco Bay Area, where I was raised and educated in public schools and Catholic schools—growing up, I hated the repressive atmosphere of Catholic school but I’ve come to see how I also benefited from something that was offered in that milieu. As a young adult, I studied at the University of California at San Diego and Berkeley, and I spent some formative years in Mexico City and Chile. Los Angeles is endlessly fascinating to me. “It’s sort of an island on the land,” Helen Hunt Jackson purportedly said about Southern California, but today it is an island of plants and people from around the globe. How did this come to be, and what are the social consequences? 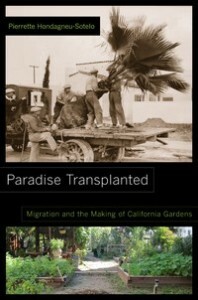 My newest book, Paradise Transplanted: Migration and the Making of California Gardens (University of California Press 2014), addresses these questions and tells the story of immigrants building, enjoying, and maintaining California’s beautiful garden landscapes. You can read more about Paradise Transplanted here. And you can order a copy here. And here is a recent article about Latino immigrant men, place-making and immigrant integration in public parks and community gardens, based on interview and ethnographic research in South Los Angeles.